The advantage of knowing when to worry is that you don’t needlessly worry when you don’t have to; the advantage to understanding the many realities of security is knowing when you have to do something or worry about something…and when you don’t. Shmulik’s friend gave him some uniforms that he no longer needs. This is a common thing in the army – to share what you have with others. When Elie left the army, he “bequeathed” many things to others and kept only what he felt he would need in the future as part of the Reserves (or things he wanted, like an empty wooden crate he’d used from Gaza). So Shmulik took the army shirts and cut off the bars that show the rank. Three bars indicate “sergeant” – below those bars, a combat soldier won’t sew the bars on his uniform. At that rank and above, he is obligated by army rules and would be punished without them. Because they wear out the regular uniforms so quickly, they pin these bars on the sleeves; only sewing them on to the dress uniforms. Jobniks – non-combat soldiers, often wear the two bars sewed on their shirt but it seems they don’t have to. 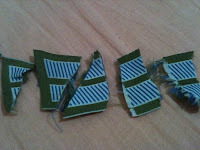 Shmulik removed the two bars from the shirts he inherited and went to throw it out. He’s a jobnik now, but still has an affinity to being a combat soldier. He tossed the bars into the garbage. “Don’t do that,” I said. I was thinking of the security risk of having these bars floating around. Elie laughed; Shmulik laughed…I’d done it again. “Why isn’t it a problem?” I asked. Elie explained – only a non-combat soldier would be wearing these. If an Arab attempted to launch a terror attack, say with a stolen rifle, while wearing a uniform with two bars, it would be obvious right away because a non-combat soldier won’t have a gun. So the gun and the two bars would be an automatic giveaway that something was wrong. Okay…but I still couldn’t get myself to throw it away until I’d cut it to pieces. Was it necessary? Who knows? As Elie points out – the bars alone are not going to stop a terrorist – with or without them. Elie notices these things, other soldiers do…and I guess if a soldier is in the area when a terrorist opens fire, the bars won’t make a difference. It’s yet another instance in which I see that the way that I think is so different than how my sons have now been trained to think. So much of what I worry about is needless and, by contrast, as I remember my pediatrician saying years ago, “you don’t know enough to worry about what you really need to worry about.” We were sharing a moment as two young mothers. She’d recently given birth to her first child and as I explained about something that was worrying me, she smiled and explained that the symptom I’d found didn’t match the disease I worried about. She explained that as a doctor, parenting was so much harder because as a mother, she had all the same concerns, as a doctor, she could dismiss some, but add so many others. Perhaps it is the same with soldiers – they can dismiss many of my concerns, but have so many others they can add. Whatever the reality, the bottom line is that the bars are shredded…and the sun shines in Jerusalem on this beautiful day as I sit here and begin my work week. And yet….A rocket was fired at Israel yesterday; it landed in an open field and caused no damage and near our home, an ambulance squad went into an Arab neighborhood to treat a Palestinian who had fallen from the 5th floor – only to come under attack as they and their ambulance were pelted with rocks; Arabs broke into a home in Jerusalem dressed as ultra-orthodox Jews on the Sabbath, and more. Welcome to a new week in the Middle East.